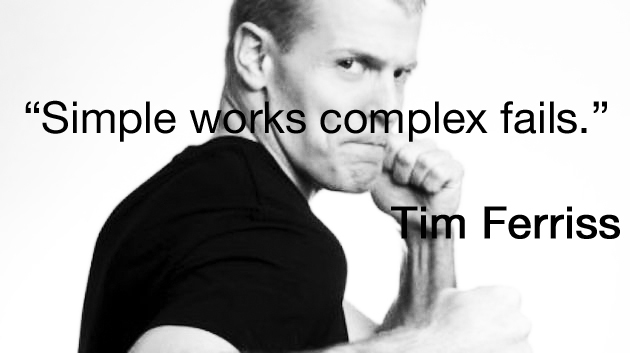 I am a big fan of Timothy Ferriss. When I first discovered him I recognised a kindred spirit. And he helped me remember why I got into all this in the first place (but that is the topic for another blog post…). I remember coming across his first book “The Four Hour Work Week” in Boarders back in 2008, the title intrigued me so I picked up a copy. Although the idea of having a 4-hour work week didn’t particularly interest me. I do what l love and, as Confucius said “Choose a job you love and you will not have to work again”. But I thought it would help me get more productive and I liked the idea of developing “Muses” (an almost automated business or part of your business that brings in residual income – something I am still working on!). But what really intrigued me about Timothy was his hobby of collecting skills (something he calls Meta Learning). He has developed a way of deconstructing any skill so you can (he claims) become one of the top 5% in any given field in 6 to 12 months. A bold claim! But, having read what he has written (and so far his model seems woefully incomplete, either he cannot express it well enough yet – which is very common with people who have developed an excellent skillset or ability – or he is holding back a lot of information) I can understand how he thinks you can get there. I am quite surprised that he has not come across NLP. Although the accelerated learning part of NLP has fallen out of favour recently. One of the key steps to becoming this good is something Tim has borrowed from medicine; the idea of the Minimum Effective Dose (MED). What is the absolute minimum we need to do to get the results that we want? So many times I have seen interventions and strategies and models that are so damn complicated, no wonder they don’t do anything! That was it, they were going to only produce 4 computers a personal and professional version of a laptop and personal and professional version of a desktop. And that was how Apple was saved. It is something that informs everything that I do – “what is the minimum that we need? What can we get rid of?”. So often people look at it the wrong way round and ask what MORE do we need? This leads to complication and I am also a great believer in simplicity – it is one of my guiding principles of how I use and teach NLP is to keep it simple (and the philosophy between my NLP Demystified series). Hi Matt, I spoke earlier and you suggested I leave my questions/comments here… I trained in Birmingham back in 2004 & 2006 with Nick, and yourself however my NLP certificate has now expired (as of 30/09/2012). Could you please therefore, advise on the prodedure for renewal of this.